2015 / The fifth volume of the AVU Research Centre series. Peter Bürger’s Theory of the Avant-Garde (1974) is an essential contribution to the reflexion of the contradictory tendencies at work within modern art. Bürger characterizes the avant-garde movements of the first half of the twentieth century as an attack on the institution of art, guided by the aim to merge art and life praxis. According to Bürger, this avant-garde intention manifests itself primarily in the form of the production of “inorganic” artworks. Bürger maintains that avant-gardes have failed in their aspirations, yet nonetheless grants them the role of a fundamental break in the development of modern art. In Bürger’s view, the avant-gardes’ historical importance resides in the fact that they have made recognizable the normative frame of art as an institution and its decisive influence on the social import of artworks. The overarching function of art as an institution in bourgeois society is determined by the principle of autonomy: as art detaches itself from life praxis, it opposes itself to society yet also surrenders its ability to act on it. After avant-gardes, Bürger assumes, aesthetic theory cannot take the autonomy of art for granted, but has to analyse the function each individual artwork performs in bourgeois society precisely by virtue of its autonomy. 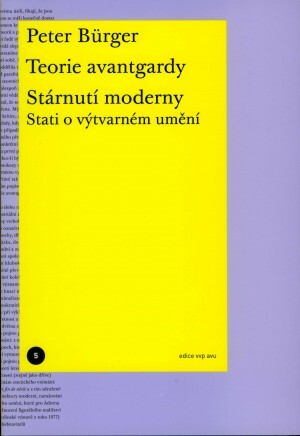 What made the book famous was its sharp critique of the post-war neo-avant-gardes who according to Bürger institutionalized avant-garde strategies and thereby divested them of their original critical substance. 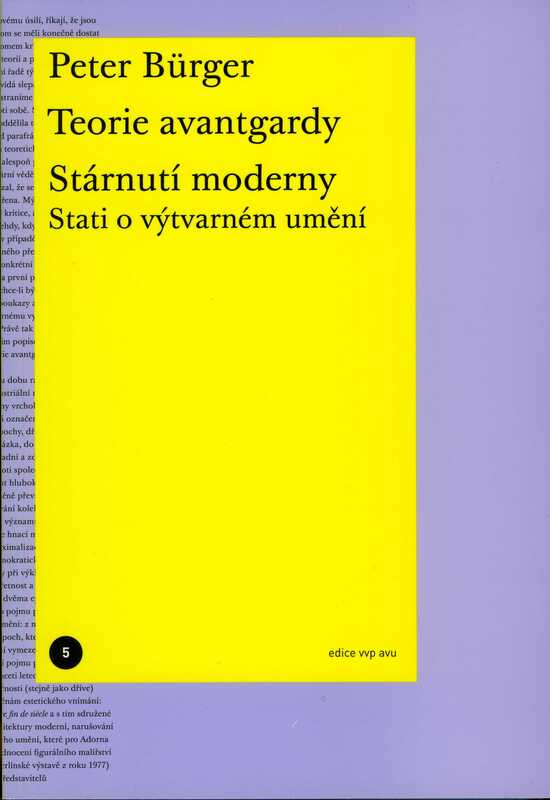 In this edition we accompany Bürger’s most important theoretical work with the translation of essays from his collection The Aging of Modernism (2001) which consists mostly of texts concerning visual arts. Essays from this anthology illuminate the theoretical edifice of Theory of the Avant-Garde with analyses of partial problems and specific examples from the history of art. At the same time they complete the overall picture of the fate of modern art with the reflection of art phenomena of the last decades of the twentieth century, as described by the term postmodernity. In the individual articles, Bürger pays close attention to a range of personalities who were pivotal for his aesthetic thought. Besides representatives of critical theory (Theodor W. Adorno, Walter Benjamin), we find there also a number of influential artists from the nineteenth and the twentieth century (Vincent van Gogh, Pablo Picasso, Marcel Duchamp, Joseph Beuys, and others). The book will be available at selected bookstores, from the online bookstore at www.kosmas.cz or at VVP AVU.